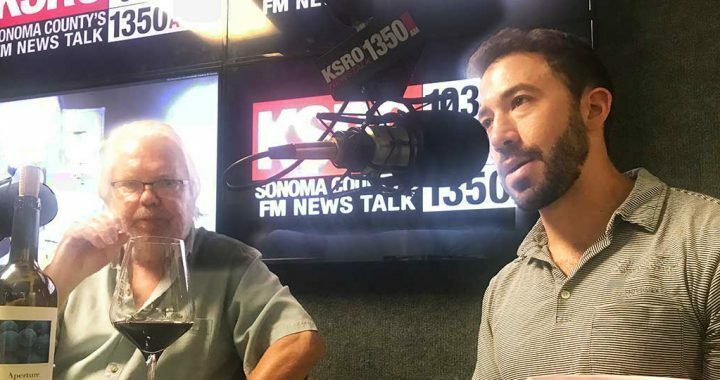 Jesse Katz of Aperture Cellars and Devil Proof Vineyards joins Steve Jaxon and Tom Simoneau on California Wine Country this week, while Dan Berger is still on vacation. Jesse Katz’s father Andy Katz is a very famous photographer in Sonoma County and his pictures are on the labels of Aperture Cellars wines. Jesse grew up in Colorado and spent time in Tuscany, Burgundy and Bordeaux, as he grew up. His family had the European habit of having some wine with his meals. His father made many books of photographs of wine regions so the family spent time in these places. Aperture Wines labels with pictures by Jesse Katz’s father, photographer Andy Katz. Jesse Katz went to business school in Santa Barbara, thinking he would work in the wine business, although not making it. He worked at Fess Parker winery in Santa Barbara. (Fess Parker was famous for playing Davey Crockett on television and his young fans, like Steve, wore coonskin caps.) His son Eli has continued their winemaking business. Jesse was an intern there for one year, following the winemaker and the viticulturalist. He discovered that he could study enology, was admitted at UC Davis and Fresno State, and decided for Fresno since they had a working winery on campus at the time. He graduated and then went to Argentina so he could work two vintages per year, southern and northern hemisphere and he tells about several prestigious names in the US and Argentina that he worked for. Tom Simoneau sold his grapes to Jesse in 2010 and he never walked the vineyard more than that year. 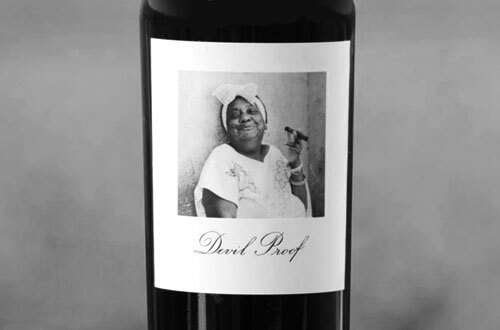 The Devil Proof Vineyards label. Jesse Katz begins by opening a Sauvignon Blanc from Aperture Wines. He uses special barrels with toasted Acacia wood and there is 10% Semillon, which Tom says gives it a nice texture. Steve raves that this is special and different. Tom says, people think New Zealand, green, stainless steel style, but this is also a creamy buttery round rich style for a SV. Stirring the lees gives it that character. Jesse agrees this is different than the New Zealand style. This vineyard is in Bennett Valley, and the days are warm but the nights are cool. Aperture 2016 Red Wine, a blend of Merlot Cabernet Franc, Cabernet Sauvignon and Malbec (4 of the 5 red Bordeaux varietals, there’s no Petit Verdot in this). Jesse Katz says he wanted to make wine that grows in certain soil types. Clay loam soils are found in the right bank in Bordeaux. They hold more water so it lengthens the growing season, and it’s good for Merlot and Malbec, as long as you can get good drainage and control the canopy size. They can get to 100 degrees by day but down to 50 by night, so he gets a longer growing season. Steve Jaxon asks Jesse Katz to talk about his father Andy Katz’ photography career and how he got Jesse into the wine world. He and his father still travel every year. He had the opportunity to travel to the great wine regions of the world when shooting photographs for his books about wine regions. Tom Simoneau says that he must have 5 of Andy Katz’ books of photographs on wine regions. He just published one about Sonoma. Jesse also describes a book about “the club of nine” being the nine main historic Bordeaux areas. Now they taste the 2016 Alexander Valley Cabernet Sauvignon. There are 5 vineyards in this, all red volcanic soils, from the eastern side of Alexander Valley. These soils have very little organic material in them so you get smaller cluster, smaller berries and more concentrated flavors, for making a rich style of wine. There is 6% barrel fermented Malbec in this. He uses about 60% new French oak. He produced about 3000 cases of this, and this and the Sauvignon Blanc are on sale at their website and at Bottle Barn. Tom suggests getting on the wait lists for both of his labels. Tom also mentions that Jesse deserves credit for the great philanthropic work that he does, and one bottle at auction raised $350,000 at a charity auction.